Industrial Strength Clickers in Stock! Our 2 for 1 piercing sale is only running for 5 more days, so come take advantage of it while you can! We’re in from 11am – 6:30pm today! 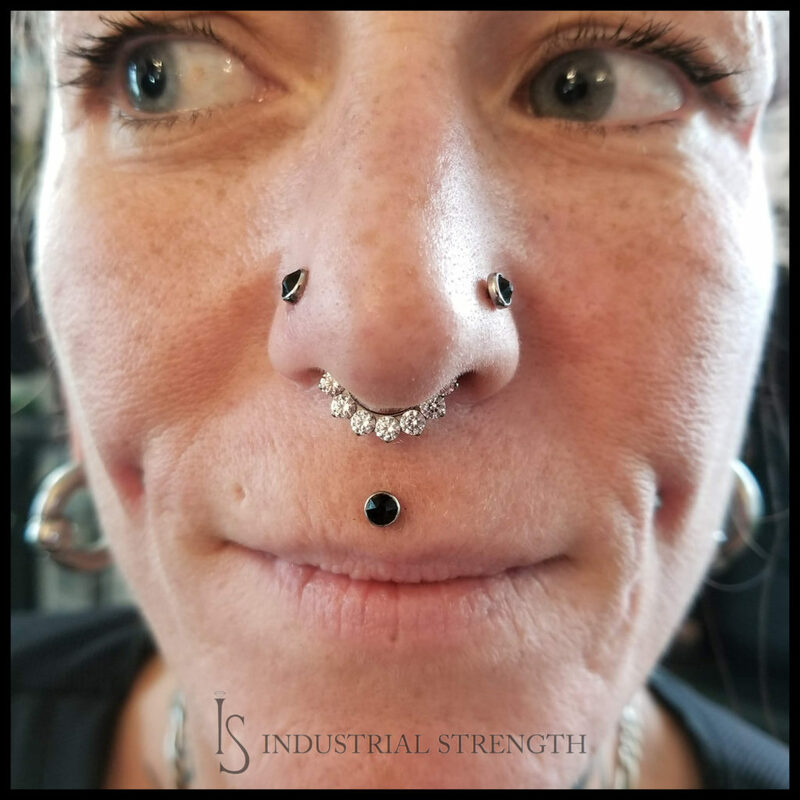 Pictured below: Amanda’s super pretty septum clicker by Industrial Strength! 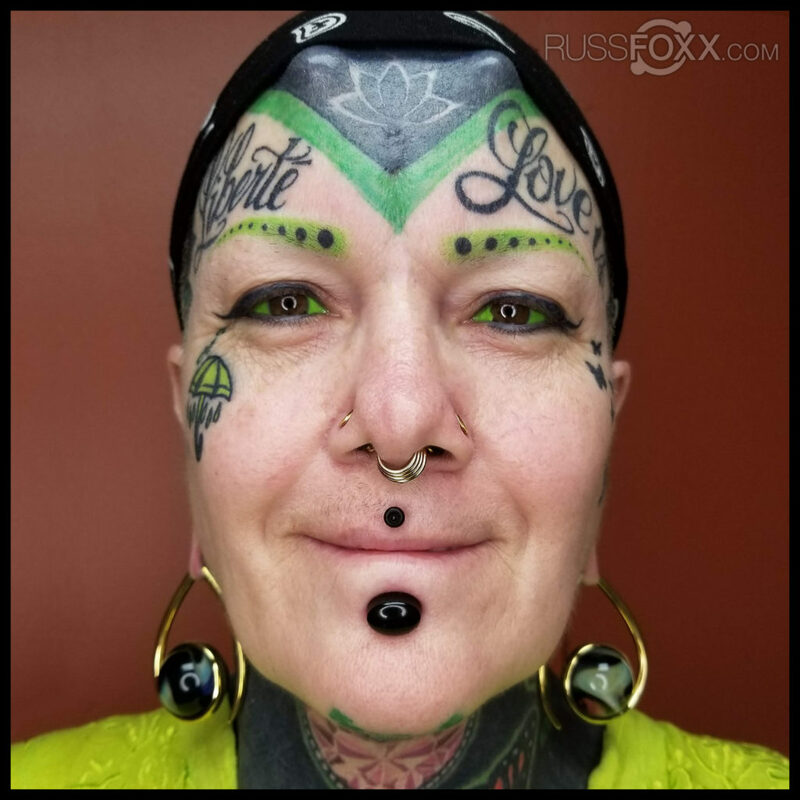 Hinged implant grade titanium with Swarovski faceted gemstones. New Gold Pieces in from Alchemy Adornment! DURING our Piercing Sale! Since beach days are off the table for awhile, fall/winter is the perfect time to take care of and heal that new piercing you’ve been wanting! 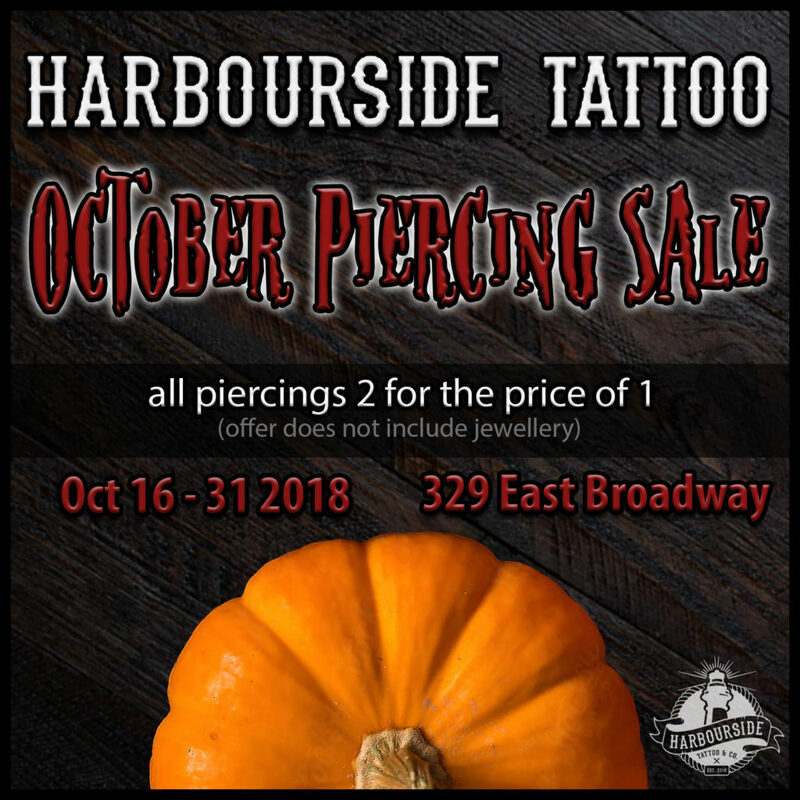 Timing couldn’t be better, since we are currently running a 2 for 1 piercing sale until Halloween! Come visit us at Harbourside Tattoo & Co and get your classy on! 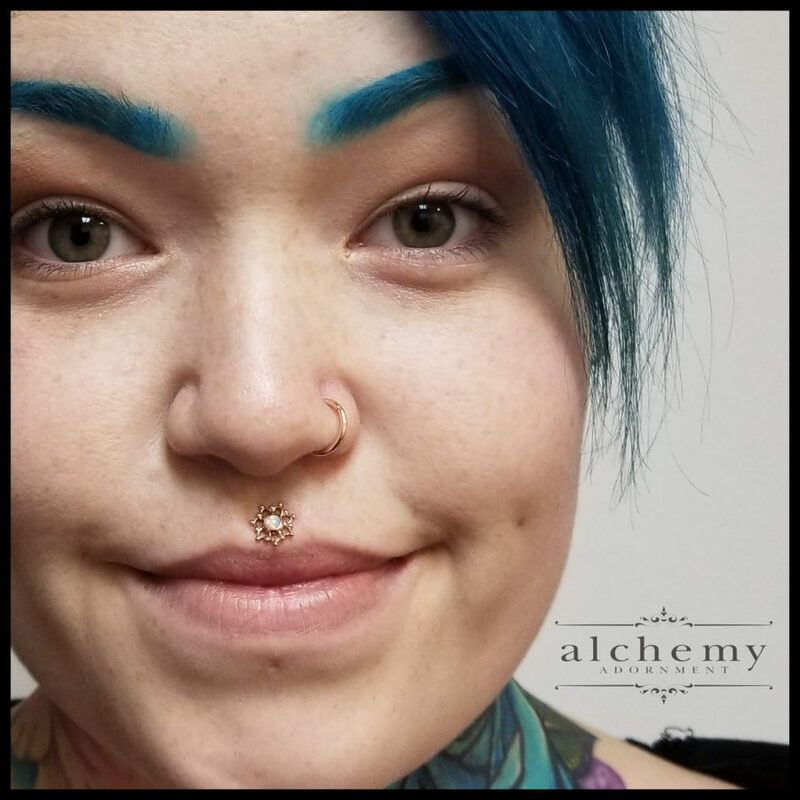 Pictured below: Katt’s new 14k rose gold “Krystal” threaded end w/ white opal center by Alchemy Adornment! We carry these pretties in all the flavours: yellow, white and rose gold! I’m available at Harbourside Tattoo in Vancouver all day today! I’m at Harbourside Tattoo & Co all day today, Vancouver! Come visit me and check out our huge selection of high end body jewellery! So much gold! Now Taking Bookings in Kelowna, BC at Pharaoh Tattoo Studio! I am available Tues Oct 23 in Kelowna, BC for bookings with my friends at Pharaoh Tattoo Studio & Piercings! Suspensions with The RISE Suspension Crew in the evening! Now Taking Bookings In Airdrie, AB at Human Kanvas! This is my last visit for the year, so catch me while you can! Last Call, Edmonton! Next Stop: Calgary! Saturday is my last day in Edmonton kicking it with my pals at HandCrafted Tattoo & Fine Art! I have a bit of time free early in the day, so get at me quick if you want in on it! Here’s a set of fresh horns on my friend from down under! Today is day 1 of 2 in Edmonton at HandCrafted Tattoo & Fine Art! I have limited availability remaining, so get at me quick if you’d like to be squeezed in for anything! 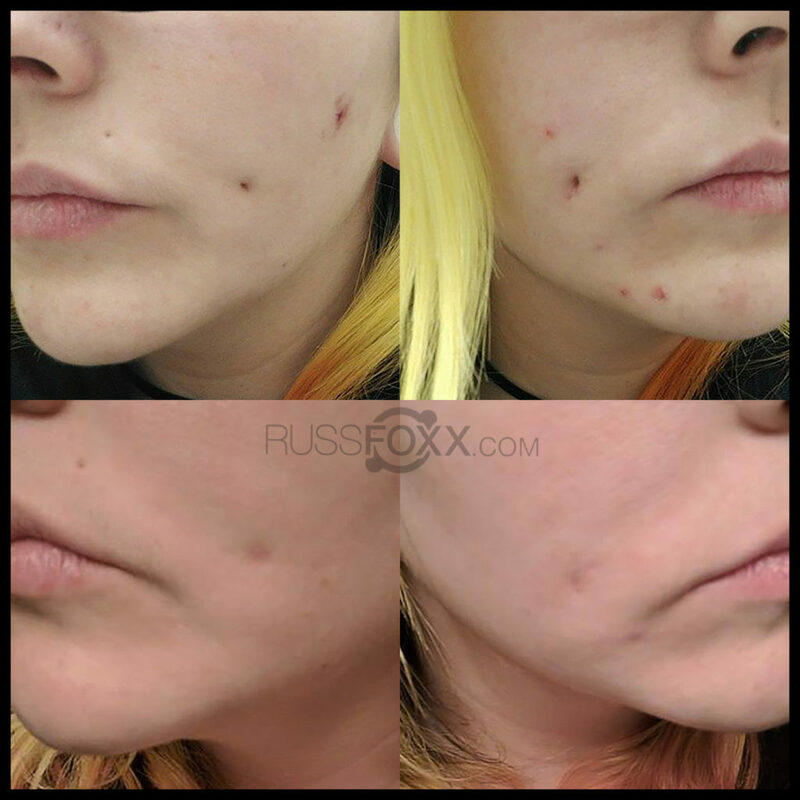 Here’s a set of cheek piercing scars reduced and healed. I’m taking care of final appts in Saskatoon this morning at Rites of Passage Tattoo, followed by a stop in Lloydminster around 5-6pm at Dark Hour Ink! Next stop: HandCrafted Tattoo & Fine Art in Edmonton, AB Oct 19-20! I’m available Oct 17 in Saskatoon at Rites of Passage Tattoo! Availability is limited, so book in while you still can! Suspensions with The RISE Suspension Crew will be starting in the evening. Time/location TBA. 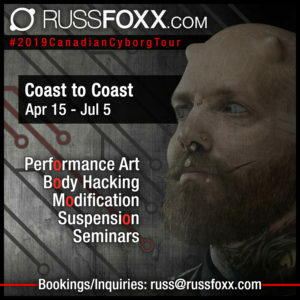 Email russ@russfoxx.com for piercing/modification/jewellery/suspension bookings and inquiries. I have limited availability at Gaslight Tattoo Parlour Oct 16, so get at me quick if you’d like me to fit you in for anything!